There was always going to be some element of controversy during the opening weekend of the six nations. Aside from the English effectively beating themselves a subject came up that not all rugby players or fans will be too familiar with. Physics. During Italy’s rather impressive display against the Welsh, minus the horrific opening five minutes, some questioned the Azzurri’s first try as Campagnaro appeared to pass the ball forward. The try was given, why? This is a relatively simple concept, the ball goes forward, it is illegal, a scrum is awarded but, Campagnaro didn’t throw the ball forward. Although the ball was received in position closer to the opponents try line than that of which it was released, the motion by the Italian center passing the ball was backwards. It was the balls momentum that carried it forward. Newton’s 1st Law of physics states that an object in motion will stay in motion until an external force is applied to it e.g. if a player is running forward when he releases the ball, the ball will then continue to move forward until stopped by an external force (another player). Not to hard right? It becomes more difficult when in a game and there are other players crashing into each other stopping them after the ball has been played exaggerating further the forward momentum of the ball. This is where the TMO official has a big role to play in that he has the benefit of video replays from a multitude of angles in super slow-mo allowing these passes to stand. If the video replay shows the passers hands travel in a backwards motion the ball is deemed to have travelled backwards. Fans can’t be blamed for shouting forward pass in cases like this because it really does look like a forward pass, leading to confusion among many leading some to ask ‘Why don’t we scrap this rule and go back to basics?’ This to some degree does make sense. If the ball goes forward then it should be penalized simple. The more you look into this matter however, the more you realize this is simply impossible because that would technically mean every pass is forward. The IRB released this video in 2011, prior to the World Cup in New Zealand, which demonstrates this. Rugby’s not becoming American Football, you won’t see a 40 yard over arm throw but, the ball, in relation to the ground does travel forward, what is important to note is that if the ball in relation the player passing has travelled backwards then the pass is legal. 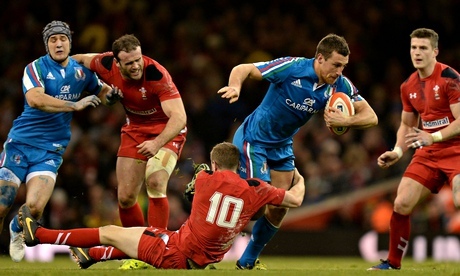 This Post was posted in Rugby and tagged Italy, Rugby, Sixnations, Sport, Wales. Bookmark the permalink.